A few days ago I wondered whether I’d made a mistake buying MGSV: The Phantom Pain. 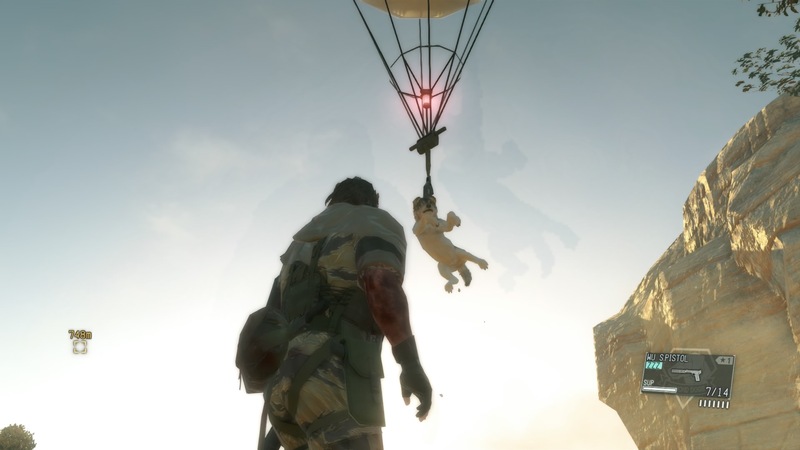 Up, up & away: Yes, that’s Snake fultoning a puppy back to Mother Base. So, I completed the mission, returned to Mother Base to wash off the blood, not really giving the puppy a second thought, then this happened as I stepped from the helicopter. Oh, Mr Kojima, you know how to generate the “Awws” from me. Nice work. After your initial review, it’s interesting (to me anyway) re: your approach to be more stealthy rather than “gears of war” guns blazing. My flatmate and I played this way back when it was on the original Playstation. She excelled at it; I just couldn’t get in to it – I prefer “guns blazing” to stealth. Nice to see the warm fuzzy in your review. Made me think of the Mabari from Dragon Age 2 and how I missed seeing my one (Woofles) in some way in DAI (mind you I’m hopeless at importing my previous DA2 save game data from Origin, but I don’t recall anyone else saying their Hawke turned up with his/ her mabari in tow). I haven’t played a lot of MGS games so I thought perhaps using a more tactical approach of assessing a situation then acting might work best. It seemed it has worked, for the most part. I think I’ll keep using this strategy!